The Creighton Prep football program has adopted Riddell’s five star rated and state-of-the-art designed Speedflex helmet, which is equipped with the InSite Impact Response System, the latest in head impact monitoring technology. Our team doctors, who work the sidelines at every Prep football game, have fully endorsed this program as a means of aiding in the protection of our athletes. Ensuring the players are protected is the number one priority, and with InSite and Speedflex, our athletic trainer, team doctors and coaches now have an extra set of eyes that helps them better monitor the action on the field of play. Riddell InSite is a football helmet-based sensor technology that alerts sideline staff when a player experiences a significant single impact or multiple impacts during a game or practice. The software delivers robust information about player head impacts including the location of the impact. That data is collected and used by the medical staff in order to evaluate player health during and after the game or practice. The Speedflex helmet, which contains the sensor technology, features unique flexibility with a specially engineered helmet shell, face mask and face mask attachment system that reduces impact force transfer. 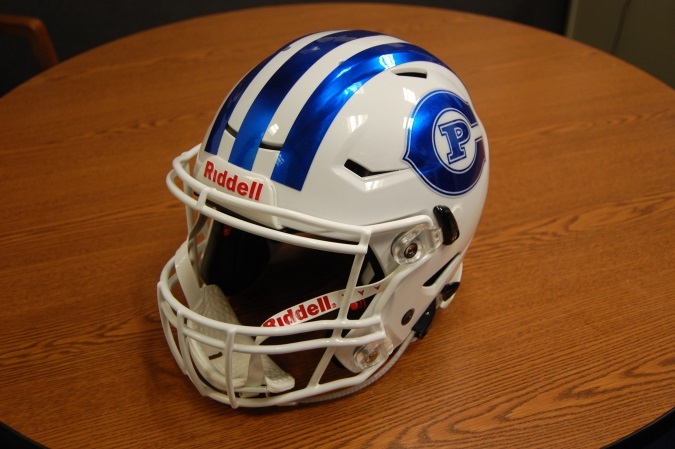 In order to outfit every Creighton Prep football player with the Speedflex helmet and InSite system, we needed to raise $80,000 to fully support the project and, thanks to an $80,000 lead gift from Prep alumnus James O'Brien '65 and his wife Barbara, that goal has been met. This program is a major step in ensuring Prep football players receive the best protection possible as they represent their school and community on the gridiron, and we would like to thank Jim, Barb and all the other donors who, together, made this program a reality. Thanks as well to Michael Morrison, M.D., James Cervantes, M.D., and Peter Cimino, M.D. for endorsing this program! Please contact Director of Athletics Dan Schinzel at dschi@prep.creighton.edu if you have any questions.